At the Juanita Street campus of San Diego’s Thrive Public Schools, the day begins with a high-five and a warm greeting at the visitors’ gate. The charter elementary school currently occupies a handful of compact, semi-permanent buildings and a blacktop in a hilly stretch of the City Heights neighborhood. Its electronic gate is still pretty new; when Juanita Street first welcomed students in the fall of 2016, it was short of a few amenities that families typically look for, like play structures and a performance space. Almost two years later, the campus resembles a forward operating base more than a traditional school. But if the raw materials look like they were just dropped off an IKEA truck, the educational vision behind them is deliberate and assured. The purple modular classrooms that roughly 200 kids filter into each morning are festooned with student artwork and pictures of world leaders like Gandhi and Barack Obama. The outdoor stage facing the main office was constructed by the students themselves, part of Thrive’s philosophy of project-based learning. The ad hoc look at Juanita Street reflects the dizzying growth of an organization still in its gestational phase. Thrive opened its first campus about a mile north in 2014, serving an initial class of 45. Today, the network’s three schools enroll about 640 children from TK (transitional kindergarten) through high school. A new TK-8 campus opened this fall in the city’s Linda Vista neighborhood, and Juanita Street’s fifth- and sixth-grade programs were absorbed among the other schools. At the center of all this frenzied activity stands Thrive founder and CEO Nicole Assisi, a career educator who has worked in the San Diego Unified School District and helped found two other charter schools. Though 500 miles of California coastline separates City Heights from Silicon Valley, she sounds a bit like a tech mogul when she speaks about her vision for the organization — returning periodically to the mantra of “reimagining public education” and describing her role as that of an entrepreneur. “If a hospital were run the way we run schools, it would be like, ‘Welcome to the hospital! It’s MRI day. I know you’ve got a heart murmur, but no problem! We’ll give you a brain scan,’” she said. Here’s what learning looks like at Juanita Hills: Olivia, 8, and Russell, 10, are both finishing up their first year in Core 3, a combined track of third and fourth grades. After their morning meetings, they’ve gathered in teacher Michael Tong’s class to talk about the Light of Kindness. That’s not a motivational poster of a lighthouse hung over the chalkboard. It’s the name of a project they completed a few months back. Along with math and literacy, Thrive students focus on project-based learning. Each class takes roughly eight weeks, three times over the school year, to develop a project they complete together. The stage outside was one such project, created with the help of staff and a few parents. They’ve also created their own books and flown a fleet of drones over the blacktop outside. The Light of Kindness merges community service with a rudimentary form of electrical engineering. Using paper, cardboard, and LEDs, students in multiple classes created DIY lanterns. The process was, as they say in northern California, iterative: The kids first brainstormed how to get started, then completed a few drafts in successive schooldays, tinkering with new approaches, before revealing the finished product. But they saved the best step for last: Working with a local charitable organization, the Bridge of Hope, some of the students distributed their handiwork to refugees who’d settled in San Diego from Syria. 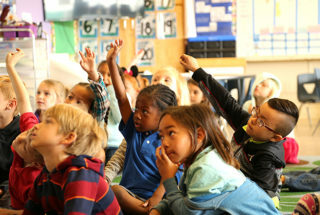 The project perfectly distills Thrive’s three-part educational model, which pushes students to learn to learn (using evidence-based instruction to build academic skills), learn to do (developing the skills of collaboration and problem-solving through hands-on projects), and learn to be (cultivating a sense of citizenship and social action in wider communities). The project-based approach is meant to inculcate in students not only a sense of achievement but also ownership over their education. Russell, vastly more articulate than a fourth-grader has any right to be, confidently predicts that the act of completing and presenting his work has prepared him for life beyond school. “You know how one of the biggest fears in the world is going up and talking to a big crowd of people? That’s what we do on our exhibitions. Parents come up and you have to explain your project. And we kind of get used to that, so when we get older, we can just talk about what our new invention is,” he says. Olivia, nearing the end of third grade, moved to Thrive partly because she was struggling academically in her old school. Today, she raves about the help she gets from her math teacher, Mr. Tong, and the small-group interaction that is a feature of the network. Like all new students, Olivia received a personalized learning plan — like the Individual Education Programs for special education students but designed to account for her learning strengths and weaknesses. Teachers and students craft them together, incorporating both personal goals and a road map to achieve them. As the year progresses, the school integrates new academic data into the plans, adjusting assignments and classroom groupings accordingly. “I’ve been getting really good in math, and I’m already getting catched up to third-grade math,” she added proudly. Her sense of accomplishment is backed up by hard evidence. In fall, winter, and spring, Thrive students are evaluated using the Measures of Academic Progress (MAP) test, a widely used computer-based test developed by the Northwest Evaluation Association. Olivia’s performance indicates that she has not only met the goals in her personalized learning plan but almost doubled them. Olivia’s growth in a trouble subject seems typical of the network’s results so far. Though Thrive has only conducted MAP evaluations over its first four years, early returns have been impressive. In six out of 10 grade levels, Thrive students are meeting or beating national targets for growth in math. They score in the top 1 percent nationally for reading growth. No charter school founder can bank on that degree of immediate impact. Assisi certainly couldn’t. Indeed, Thrive almost didn’t get off the ground. After spending a year setting plans in motion, Assisi won the provisional approval of San Diego Unified’s staff for its petition to open the first Thrive campus in late 2013. Prospects looked great at the authorization meeting before the city’s elected school board the following January. But it didn’t work out. Citing a purported saturation of charter schools in San Diego, three members of the five-member board voted against authorizing Thrive. District staff swiftly withdrew their support, and for a time, the school’s opening looked to be in danger. But after appealing to county authorities and again coming up short, Thrive’s leadership finally took the fight to the state Board of Education. After months of wrangling, their charter was at last greenlit, giving them just a few months to get underway before opening their doors in the fall. The fight to open Thrive occurred in an atmosphere of growing contention around school choice in California. The state’s charter sector has grown by 25,000 students every year for the past 10 years, and total enrollment now stands at 630,000. A 2014 report from the National Alliance for Public Charter Schools lists San Diego, along with Los Angeles and Oakland, as one of America’s largest charter school communities. Unsurprisingly, the rapid expansion has produced a response: Last year, state Sen. Tony Mendoza sponsored SB 808, a bill to give local school boards ultimate authority over approving new charters, ending the process by which founders can appeal to county or state officials. If the appeals process hadn’t existed in 2014, Thrive would not exist. Instead, the network’s footprint has steadily grown since 2014. To spread from one campus to three, Assisi took advantage of Proposition 39, a state law that compels school districts to give space to charters within available buildings. That tactic has become common in California — roughly one-third of L.A.’s independent charter schools are co-located with district schools — though marriages struck under Prop 39 can be awkward. 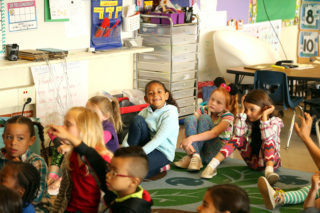 The Juanita Hills campus is co-located with Carver Elementary, a pre-K-5 school that enrolls much higher proportions of disadvantaged students and English learners than Thrive. The two facilities share the same lot, but a long blue line has been painted down the center to separate them. A Thrive parent complained that though Carver had its own library on-site, Thrive kids couldn’t use it. At recess, a few students remarked that encounters across the boundary can be tense; when balls roll over the blue line, they can only be collected if Carver students aren’t present. Carver Elementary’s principal, Maria Elba Vera, did not respond to a request for comment. Whatever hurdles the schools’ leaders had to overcome before getting started, they set out an incredibly ambitious task for their first few years. Thrive was created to be not only innovative in its approach but also diverse in its student population. To a surprising degree, it has succeeded. According to a study conducted this year by the Center on Reinventing Public Education, Thrive’s populations of special needs students, black students, and English language learners are all proportionally larger than the averages for San Diego or the state of California. Roughly half of its students are eligible for free or reduced-price lunch, and over 40 percent are Hispanic. Even more striking, the network focuses specifically on the provision of special education services, placing aides directly into instructional periods to work side by side with general education teachers. While students with IEPs have access to individual staff members trained to work with them, 99 percent spend at least four-fifths of the day in general education alongside typical students. That’s far above the national average of 68 percent. Assisi says the emphasis on student heterogeneity is critical to Thrive’s success. Kurth, who has worked in both public and private schools and has been with Thrive since the early, uncertain days, says the secret to Thrive’s success as a diverse community is the relationships it fosters with its charges. “Getting to know students and their families, deeply, is important. Because we know we can’t learn if we don’t feel safe, if we don’t feel valued, if we don’t feel seen and heard,” she said. That drive toward personal outreach and collective responsibility is evident in another Core 3 classroom, where students are preparing for their student-led conferences at the end of the week. Instead of a typical parent-teacher check-in where adults guide the proceedings, Thrive encourages students to take the initiative by devising somewhat elaborate presentations on their progress at school. Russell, already finished with the task at hand, is freelancing with his classmates, encouraging them to come up with their “grows” (areas in need of a little work) and “glows” (points of pride). He stops at a cluster of desks where his friend Max, 10, is sitting, busily charting his progress in literacy, math, and project-based learning. Their classmate Kingston, 8, is seated nearby, lagging a bit. Under “glows,” he listed his ace performance in the online game Helmet Heroes. Kingston pauses. “Not technically,” he says sheepishly, then begins revising. Max, who wants to either become a neuroscientist or play for the Padres when he grows up, turns the group’s attention to another class project, completed earlier in the year. For weeks, they’d examined their strengths and weaknesses, using the metaphor of the iceberg to describe which personal traits were most visible to others and which were hidden from view. On the wall, next to a huge collection of paraphernalia from California universities like Stanford and USC, they had hung meticulously rendered pictures of their icebergs. Above the surface of the water were their notions of how others perceived them: Friendly, hyper, moody, mean. Beneath the surface were their identities as they understood them. With evident pride, Kingston pulls his picture from the wall and shows it to the others.